Los Angeles County Sheriff’s Department’s Missing Persons Unit detectives are seeking the public’s assistance in locating DeJuan Ali Rhodes. 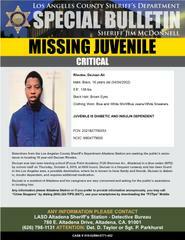 He is a 16 year-old male Black who was last seen leaving school (Focus Point Academy 3126 Glenrose Avenue, Altadena) in a blue sedan by school staff on Thursday October 4, 2018 at 9:30 a.m.
Mr. Rhodes is described as 5’08, 138 lbs., black hair and brown eyes. He was last seen wearing a blue and white shirt, blue jeans and white shoes. He is a diabetic and is insulin dependent. His friends and caregivers are very concerned and asking for the public’s assistance in located him.